This is one of those weird novels that you come out of not knowing whether or not you liked it. In fact, I almost decided against writing a review because I had no idea what to say about it. I tend to write most of my book reviews while I am reading the book: I write down all of my thoughts as I read, then organize and add onto them as needed after finishing the novel. By the time I get to my computer, I tend to have most of my review written. But with this, as I read I distinctly noticed that I had no idea what to think. It’s not that I didn’t understand what was going on, but that I had so little idea as to where the novel was heading that I couldn’t formulate an option. Maybe that’s a bad thing, but I was certain that I was enjoying the novel, even though it just got weirder as it continued. The Particular Sadness of Lemon Cake follows the life of Rose Edelstein, who, on her ninth birthday, discovers that she can taste the emotions of the person who cooked her food—sometimes feelings of which even the cook is unaware. The novel then follows her life as she grows up and copes with this gift (or curse), the normal tribulations of adolescence and teenage-hood, and, particularly later in the novel, her brother’s mysterious habit of disappearing. The novel goes somewhat unevenly between Rose’s relationships with her mother, brother, father, brother’s best friend, and other people in her life. In doing so, it often jumps suddenly forward in time, making it a bit fragmented—but it kind of works, given the content. However, as I was reading I did feel like I was kind of on the outside, occasionally getting glimpses into Rose’s inner thoughts and desires, despite the novel being told from her first-person perspective. Consequently, I suppose it lacks the character development that one might expect. It also doesn’t exactly have a plot, but again, I feel like that suits the premise (that doesn’t mean that nothing happens, but that the things that do happen are more gradual changes). But if you need a book with a very solid, consistent plot line, this is probably not the book for you. 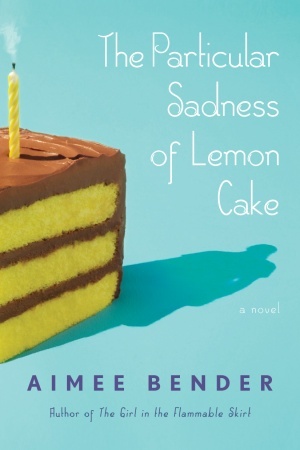 Especially in the beginning, The Particular Sadness of Lemon Cake reads like it should be light and fluffy, but, until late in the novel, everything is tinged with a depression that is never really pointed out. I read this novel immediately after finishing This Mean Disease, Daniel Becker’s memoir on growing up with a mother suffering from anorexia nervosa. In comparison to Becker’s straightforward memoir, Bender’s novel never says anything straight out—hence the feeling that I was just getting glimpses of the character’s lives, peering through a window just as Rose’s mother so frequently does, seeking Rose’s missing brother. Though it lacked that certain “oomph,” I enjoyed the novel for reasons that I struggle to pinpoint. It is bizarre, and it is hard for me to say who it is really about—her or her brother, who, even when he is not there, is lurking in the shadows. Perhaps the novel could have benefitted from more focus, but I did like it as it is. This is one of those books I hear about often, but never knew exactly what it was about. Sounds interesting! All I know about this book is that my mom hated it. Hahah. Thanks for your review though! This is the next book my book club is reading. Sounds unique! Thanks for the review. I had heard a lot about this book (mostly people saying they didn't like it) and I didn't really get the premise. I might have to try it to get my own opinion! I've had this book on my TBR list since I heard about it. It sounds interesting. I was going to read this book but now I'm not so sure. Thanks for your honest review. I read this book and loved Bender's writing style. The story was whimsical and far-reaching-it was like a fable, for me. Thanks for your excellent review. Sad! I love the title of this book and had higher hopes for it than what your review states. I'm not sure I love the cover either.